So you're saying I should replace my Audio Technica ATN95E with the Ortofon Red? Will it fit on the same thing? I upgraded the stylus on the 95E installed on my backup table, and have no problems whatsoever with it. I was able to locate an aftermarket Jico stylus with an .0003x.0007 elliptical tip which sounds better than the stock stylus. It also stands up to the Ortofon test record, tracking at 1.7g. I just bought a used Technics SL-Q2. 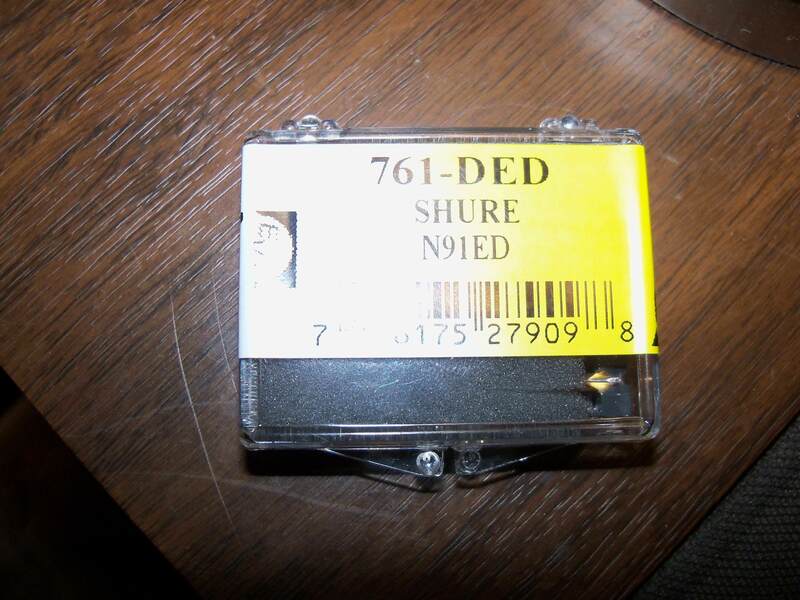 The cartridge on it is a vintage Shure M91E. I purchased a replacement stylus EVG-761-DED. The seller says its a Japan made. Or is this a Switzerland made stylus I been told to avoid? Most of not all Japanese JICO styli have a dark dot on the underside of the cantilever near the tip. The EVG styli I've bought for my Shure M93 cart have had the JICO dot on them. Those EVGs had the part number PM3136DE on them and were described as N91E and/or N91ED equivalents. What kind of packaging did yours arrive in...a plastic clamshell box with the white and yellow EVG label? It came in a plastic clamshell with white and yellow label. Mine has the blue dot on the cantilever. I see the dot. That is a Japanese JICO stylus. Thanks for your help. It seems better built than the one that was on it. This is how my stylus was labelled...looks to be same as yours. Mine is similar but the # is 761-DED on top and a different bar code #. Russell Industries on side. Mine has a black front. Mine is similar but the # is 761-DED on top and a different bar code #. Russell Industries on side. Probably. The only difference is the color of the housing. Yours is green and mine is black. Here's my case with the old stylus. I have JICO N91ED equivalents that have green, black and ivory plastic grips on them. All have dots on the cantilevers. All claim to have elliptical dimensions of .0003x.0007. It seems possible that JICO may have been supplying numerous resellers with N91ED equivalents in varying colors. Yeah, I have the exact same TT, and about anything would be an improvement over the green AT95e cart that came with it. It does kind of sound like the 2m Red is on par with the ATN100/E, which I like a lot. The 100/E says it's discontinued on Amazon though, which is where I buy most of my stuff like this. I may give the 2m a chance, but I would also have to buy another stock AT headshell to fit it onto. The standard headshell that comes with the Audio Technica works just fine...don't you have that? It is a cool & easy install, as you don't need those hard to handle nuts--the screws just screw directly into the cartridge. The 2m Blue is much better than the Red - at just over $200. I hear ya. My next upgrade -- but for now, the Red is just fine! EVG magnetic styli WERE coming from JICO. No longer. They will come from the same Swiss manufacturer that Pfanstiehl buys from. Tonar continues to source from JICO and Nagaoka. Mistracking might sound like gross distortion or maybe fuzz on the needle or a bunch of fast pops during loud passages or even clipping like an overdriven solid state amplifier. Mistracking can be caused by a badly tracking needle OR perhaps a needle trying to track an IMPOSSIBLE groove caused in mastering/cutting the actual record. Sometimes it's only on one channel, sometimes on both. Make sure you don't actually HAVE fuzz on your needle. You should be able to hear mistracking easily. Heck, I was aware of this problem when I was 15 years old. It was very obvious on my Concord/Garrard that something was wrong on dynamic peaks (usually classical) and it didn't take rocket science to figure that my records were physically suffering for it. It's up to you to determine if your machine is mistracking or not. Make sure you're not playing a used record that was already groove damaged when you got it. Could you upload a sound clip - a needle drop of a distortion tracking? How often should I be changing my needle? Like, after how many records played; 500? 2,000? 1000 hs. At 40' per Lp; do the maths. Just keep track of the number of Lps you play. It's a stylus, not a needle. The generic term "needle" comes from the old grammphone which was changed for every record. The buzz-word "needledrop" sources from the same, but describes the transfer of vinyl to a digital file. The stylus should be inspected and possibly replaced after approx 1000 hours. This translates to about 3000 album sides (apprx 20 minutes each) Stylus wear varies according to tracking force and cleanliness of the record. Clean records extend stylus life, dirty records shorten it. Worn records, when cleaned on an RCM, mostly do not affect stylus life. Some audiophiles have reported stylus service life well beyond 1000 hours, up to twice that, and confirmed by inspection and sound quality. The records must be clean, and a cartridge optimally aligned to achieve that. The conical (diamond) stylus should be inspected sooner, after about 400 hours (1200 album sides) as their smaller contact area increases their wear rate. 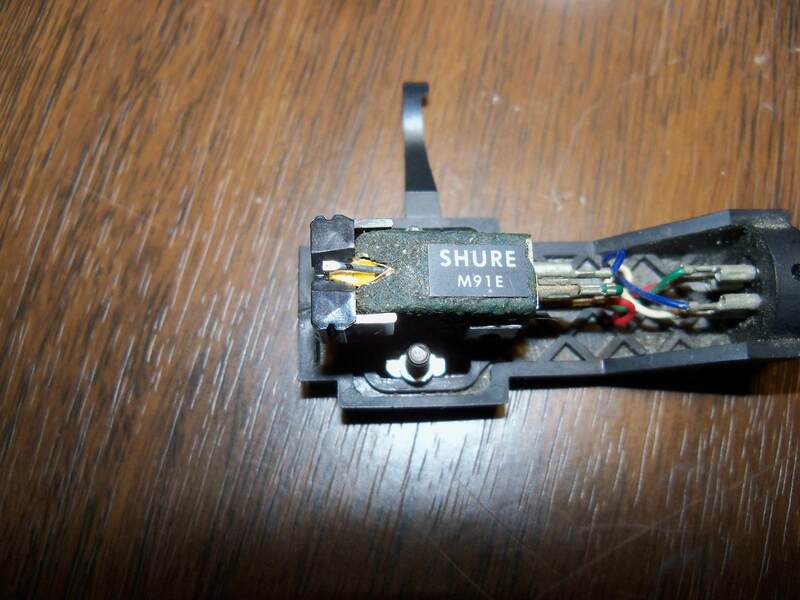 A sapphire stylus should be replaced often, perhaps about every 200 hours, but these are found only with ceramic and crystal cartridges, equipped on mass produced record changers, portable record players and consoles. The stylus should be inspected and possibly replaced after approx 1000 hours. This translates to about 2800 album sides (apprx 20 minutes each) Stylus wear varies according to tracking force and cleanliness of the record. Clean records extend stylus life, dirty records shorten it. Worn records, when cleaned on an RCM, mostly do not affect stylus life. And for another definition of a “needledrop”, ask a millennial what it means. It’s too painful for me to describe. the Ortofon works fits fine with the standard Audio Technica headshell and with Ortofon Red; it screws in directly so no fiddling with the tiny nuts that most require when installing. Thanks, I was just re-reading this thread today and was wondering if the 2m just fits. I may be picking one up this year. Scooped up a couple AT100/E replacement styli from LP Gear middle of last year and have already gone through one.